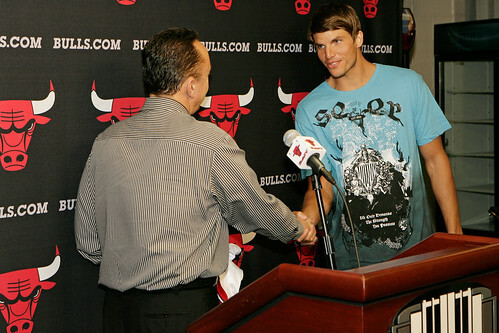 Given Kyle Korver’s Midwest roots, having grown up in Pella, Iowa, he must have been a Bulls fan during the team’s dominant run during the 1990s. Right? 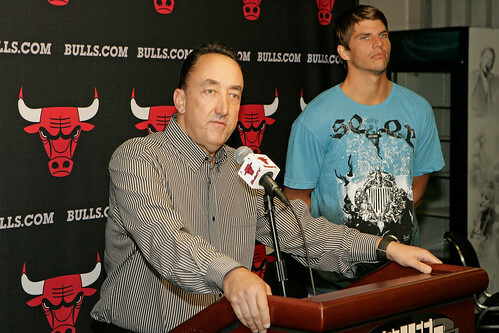 The Bulls introduced Korver, who agreed to a reported three-year deal in the vicinity of $15 million on Friday, during a news conference Tuesday at the United Center. 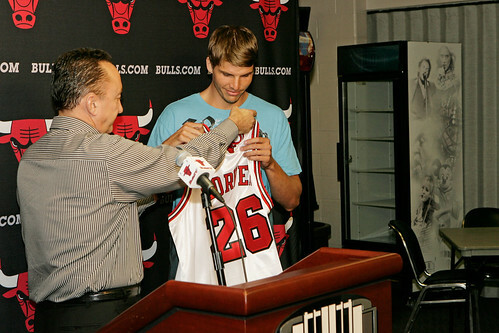 General Manager Gar Forman said that after finishing 29th out of 30 teams in the NBA in three-point shooting last season, finding a perimeter shooter quickly became a priority for the Bulls. 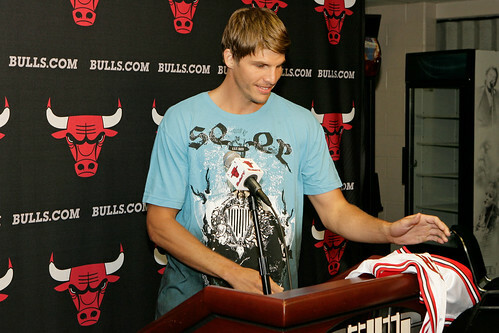 The addition of Korver, the NBA’s best long distance shooter during the 2009-10 campaign at 53.6 percent (also an NBA record for highest three-point shooting percentage in a season, eclipsing former Bull Steve Kerr’s mark of .524 in 1994-95), is a good start in doing just that. More help could be on the way, should the Orlando Magic decide not to match terms for J.J. Redick, who reportedly signed a three-year offer sheet worth around $20 million with the Bulls on Friday. 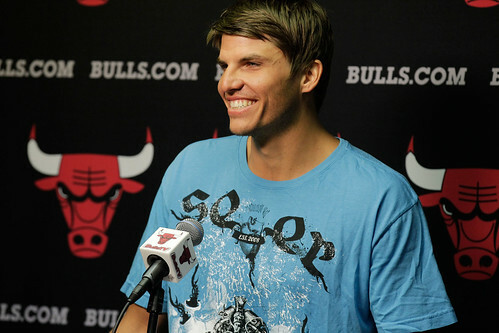 “The ability to space the floor was very important to us,” said Forman on Tuesday, adding that the Bulls contacted Korver’s agent on the first day of free agency to express the team’s strong interest. Discussions heated up last week, and on Friday, the parties agreed to terms. 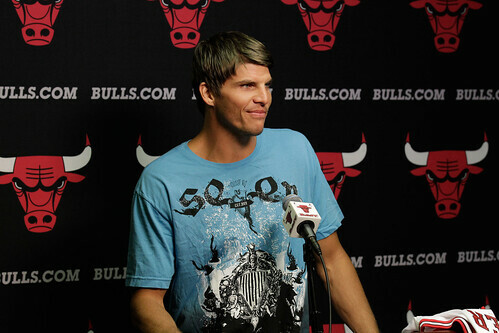 Having played with the aforementioned Boozer in Utah and sharing the backcourt with another All-Star point guard in Deron Williams, Korver said he looks forward to joining forces with Derrick Rose. 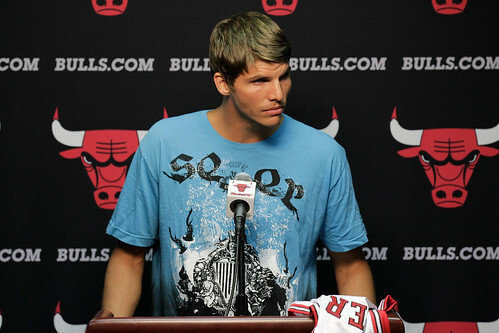 While Boozer spoke highly of Korver after coming to Chicago and recruited him to join the Bulls, Korver returned the favor on Tuesday. 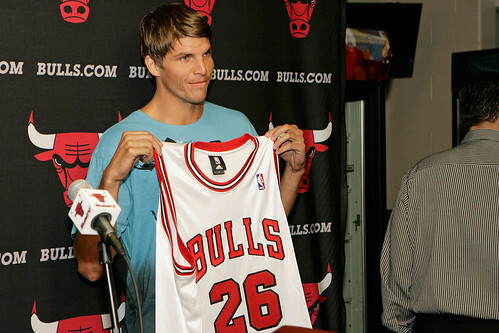 So what is next for the Bulls? In the short-term, there are more roster spots to be filled. 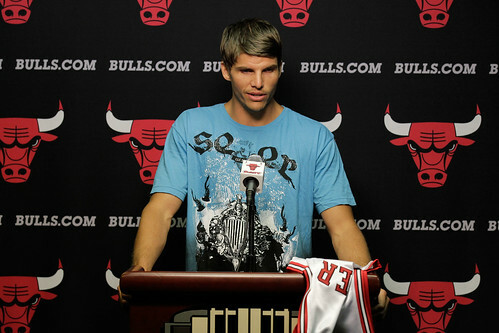 If Redick ends up staying in Orlando, Korver may have hinted at another option to help out with the shooting guard/small forward positions.